Made of good quality material, this Rubber Key Ring comes in a variety of designs. With vast industrial experience and understanding, we are offering Customised Keychains. These Keychains are designed by our highly creative professionals using basic material and techniques . 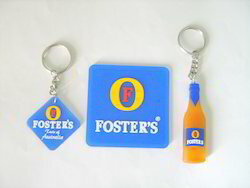 We provide these Keychains to our customers in different sizes and shapes as per their choices. Rubber Keychain customized with any logo, companys tagline, name, symbol on both sides. Minimum- 1000 pcs.